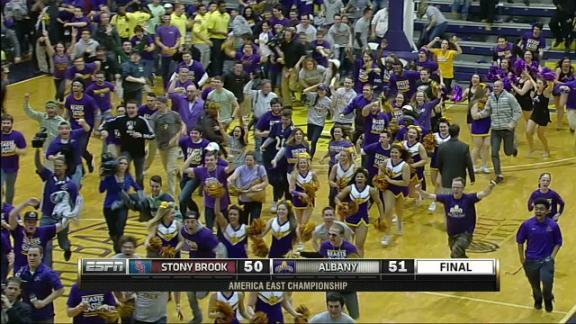 Fans storm the court after Albany buzzer-beater denied Stony Brook its first NCAA ticket. For dozens of big-time programs, an invitation to the NCAA Tournament is all but presumed every year. Failure to make the tournament is considered a huge disappointment. Coaches have been fired for less. 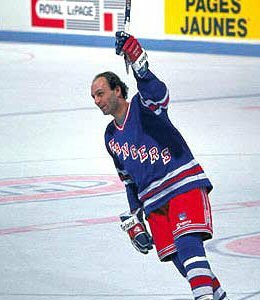 But not so for the vast majority of teams, some who have played Cinderella and many others who have never made the cut. Perfect example, Stony Brook. The Seawolves were literally less than a second away from the first NCAA berth in the team’s history when Albany State crushed their dreams with a dagger three-pointer at the buzzer in the American East championship game.Oh my. Only five of the original 160 NCAA schools have never made the tournament, which began in 1939. They are Army, The Citadel, Northwestern, St. Francis (NY) and William & Mary. St. Francis came close this year, advancing to the championship game of the Northeast Conference tournament this week, only to bow out to Robert (Bob) Morris, 66-63, on their home court in Brooklyn. Army never made it despite being coached by two all-time greats, Bob Knight and Mike Krzyzewski. But Northwestern may be the most puzzling of all the NCAA wallflowers. Northwestern began men’s basketball in 1901, was retro-picked as national champion in 1931, and even hosted the first NCAA championship game in 1939 and the Final Four in 1956. Playing in the Big Ten, the Wildcats have not had a winning record in conference play since 1968, when LBJ was President. They finally managed their first 20-win season in 2009. All told, there are 44 Division 1 teams that have never tasted March Madness. Some notables beyond the five originals mentioned above are Maine, New Hampshire, Hartford, Bryant College, Youngstown State, Grambling and Presbyterian. In 2013, Florida Gulf Coast, the 15th seed in the East, won the Atlantic Sun title, and ran off two straight wins in its first NCAA, beating second-seed Georgetown and seventh-seed San Diego State before losing to Florida in the round of 16. Last year, both Cal Poly and North Carolina Central cracked the NCAA code with first-time tournament appearances.